The eight playable characters in Halo 5: Guardians' Co-op mode, from left to right: Holly Tanaka, Jameson Locke, Olympia Vale, Edward Buck, Kelly-087, Fred-104, John-117, and Linda-058. Co-op is a multiplayer gametype found in all Halo games except Halo PC, Halo 2 Vista, and Halo: Spartan Strike. It allows two or more people to play the together through the campaign or dedicated co-op modes. Co-op gameplay consists two or more people playing through the campaign as a team. If one player dies, they can come back to life, or "respawn". The player who dies has to wait until the player or one of the players who are still alive are not engaged in combat and are at a safe location before they are able to respawn. When a player respawns in Halo: Combat Evolved, they are always equipped with an MA5B assault rifle and a Type-25 plasma pistol. In the sequels, each level has a designated pair of weapons that respawning characters start with. If all players are killed, they will restart at the last saved checkpoint. Additionally, in Halo 2, if two players are playing on Legendary difficulty and either of them die, then both of them have to start at the last checkpoint. In many of the other Halo games, players will often attempt to beat Legendary in co-op instead of single player, because they consider Legendary too difficult to attempt alone. In Halo: Reach this tactic is less feasible, because difficulty "scales" in co-op; the more players, the greater the difficulty. Scaling is also found in Halo 4, albeit to a less noticeable degree than was present in Reach. Halo 5: Guardians also has scaling. Generally however, the benefit of added players more than makes up for the increased difficulty. In Halo: Combat Evolved and Halo 2 co-op, when playing a level involving the Master Chief, both players will control two identical copies of the Chief; when playing a Halo 2 level involving the Arbiter, both players will control identical Arbiters. The presence of a second version of the character is non-canon, and is never referred to or reflected in any of the cutscenes, with the singular exception of the opening cutscene of Halo: Combat Evolved/Halo: Combat Evolved Anniversary, in which two "Master Chiefs" are depicted emerging from cryopods in the Pillar of Autumn's cryo-bay. Halo 2 was planned for online co-op mode for up to two players on Xbox Live, but due to time constraints Bungie was not able to perfect online co-op for Halo 2, the user interface still contains clues as to how Halo 2 would have had co-operative game mode, and it's even more apparent modders were able to activate this game mode. Halo 3 allows players to assume the role of John-117, Thel 'Vadam, Usze 'Taham and N’tho 'Sraom in cooperative play. In Halo 3, when there are two players, player one plays as the Master Chief and player two controls the Arbiter. 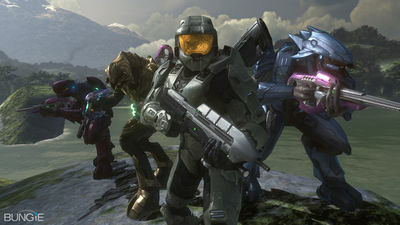 Certain cutscenes and lines of dialogue are altered to reflect the fact that, unlike in the single player mode, the Arbiter never leaves the Chief's side. In addition, all of the Arbiter's lines of dialogue outside of cutscenes are removed. In three or four player co-op, player three controls N’tho ‘Sraom and player four becomes Usze ‘Taham, though these characters do not appear in cutscenes, and are not referred to in dialogue. Player one, as the Master Chief, begins most level and respawns after dying with Human weaponry such as the battle rifle or assault rifle, while the other players, as Elites, begin most levels and respawn with Covenant weaponry such as Covenant carbines and plasma rifles. Two player co-op can be played in split-screen mode in all three primary Halo games, but three or four player co-op in Halo 3 is only available over system link or Xbox Live, with at least two Xboxes with two players on each. Co-op is available in the Halo Wars campaign, both via system link and over Xbox LIVE. However, unlike in other Halo games where co-op can be played on a single console, it is not possible to play local co-op in Halo Wars. In Halo Wars co-op, two players effectively control two separate armies that work in tandem. Players utilize the same bases and spawn buildings and units from a single pool of resources. Co-op is also available in Halo 3: ODST; just as in Halo 3, two players can play on one Xbox with split-screen, but up to four players can play at once via Xbox Live or system link. In the Mombasa Streets sections of the campaign, where player one controls the Rookie, players two through four each control an identical ODST. During flashback missions, player one controls the main character of the flashback, but the other players still control generic ODSTs, even if the flashback character is accompanied by other members of the squad. For example, in NMPD HQ, the flashback is from the perspective of Romeo, who is constantly accompanied by Buck. In co-op mode, player one controls Romeo, but player two controls a nameless ODST, leaving Buck as an NPC. The same goes for players three and four in levels where more members of the squad are available. In gameplay terms, each player can access the map and drop their own waypoint, which will show up on everyone's map, but only on the compass of the player who placed it. In addition, all players download all Audio Logs, no matter who actually accesses the terminals. Only one log can play at a time, and any player can stop the playback or start the playback of a different log. Finally, ODST adds a new co-op multiplayer gametype called Firefight, in which players are allowed to pick their character, choose their personal emblem, and decide whether or not their character is wearing their helmet (with the exceptions of the Rookie, who must wear his helmet, and of Sergeant Johnson, who cannot wear one). For more details on Firefight, see its main article. Halo: Reach, like its predecessors, has full co-op features, but unlike the previous games, no player's appearance is set. Each player can extensively customize the appearance of Noble Six in Campaign mode, and this appearance is applied to their character in co-op as well. No changes are made to Campaign dialogue to reflect the fact that there are up to four "Noble Sixes". The number of enemies is determined by how many players are present. For example, on the final section of the level Winter Contingency, there would be two Sangheili Zealots in total on campaign solo. However, if there are two players on cooperative play, there would be three Zealots in total. When playing co-op through System Link or Xbox LIVE, each player can see their own version of Noble Six in cutscenes. During split-screen co-op, cutscenes depict the version of Noble Six belonging to the player who triggered the cutscene. Cooperative play, as shown in Halo: Combat Evolved Anniversary. Halo: Combat Evolved Anniversary, unlike the original Halo: Combat Evolved, supports 2-player co-op through Xbox LIVE, as well as split-screen and System Link. Like its Xbox 360 brethren, Halo 4 features the standard co-op version of the campaign, with two players able to play locally on one Xbox 360, and up to four players playing via System Link or over Xbox Live. Because the game opens with the Master Chief isolated in the Forward Unto Dawn's cryo-bay, there is no contextual reason for other characters to be present, so, like the original Halo and Halo 2, all players in co-op mode control duplicate "Master Chiefs". It is unclear exactly what governs which weapons a player will respawn with; players have been reported spawning with a wide variety of weaponry, including cases where a respawning player will be holding a weapon with a partially-emptied clip. During the Type-32 Ghost escape sequence at the end of the level Forerunner, players who die will actually respawn in new Ghosts, so it will never become impossible to finish the level. Halo 4 also introduces the new Spartan Ops mode, a story-based set of missions taking place after the end of Halo 4's campaign intended to be played co-operatively with up to four players. Non-interactive cutscenes focus on the story of Fireteam Majestic, and gameplay levels focus on Fireteam Crimson, which is made up of the player's customized Spartan-IVs from Infinity mode. The Flood Missions form the co-op mode found in the Xbox 360 and Xbox One versions of Halo: Spartan Assault. There is no co-operative version of the campaign. With five missions, the Flood missions focus on preparing SPARTAN-IVs for the hypothetical return of the Flood. Unlike the campaign mode, which represents a recreation of canonical events, the Flood Missions are pure simulation. Like the series' other cooperative modes, Firefight and Spartan Ops, players fight together against waves of enemies to record a high score. Unlike Firefight and Spartan Ops, the Flood missions cannot be completed alone; players must play with a co-op partner over Xbox LIVE. Halo 2: Anniversary, unlike the original Halo 2, supports 2-player co-op through Xbox LIVE, as well as split-screen and System Link. In Halo 5: Guardians co-op, the players can choose to play as John-117, Fred-104, Kelly-087, Linda-058 or Jameson Locke, Holly Tanaka, Olympia Vale, and Edward Buck respectively. Each Spartan spawns with a different loadout with different abilities. The number of enemies is determined by how many players there are. Unlike past Halo games there is no splitscreen co-op. Dialogue can be altered depending on which character is present for events. Similarly each character will give and receive different dialogue to and from NPCs in the weapons-down missions. In addition, players not playing as John-117 or Locke can hear additional dialogue from these characters that would otherwise never be heard in solo play. Fireteam Osiris' character selection menu. Blue Team's character selection menu. Co-op in action, on the mission Reunion. Co-op gameplay is very different from single-player gameplay; there are several new strategies and alterations present. Starting and respawn weapons tend to vary between single-player and co-op, as do the starting weapons of each character and the strategies that can be used in co-op—some of which are documented below. The "coward method" is basically having one player hide in a safe spot while the other player charges forward and kills everything with impunity, charging again and again as they die until no opposition remains. This method of progressing is generally frowned upon in the community, but it is still commonly used to beat the campaigns on Legendary. It cannot be used in Halo 2 on Legendary, however, as if one player dies, both must restart from a checkpoint. This tactic is also rendered useless with the Iron skull active. This method can also be used by one person playing as two characters on co-op, provided that they can place the "coward" in a safe, unreachable place. In many ways, it is very much the same as the "cannon fodder galore" strategy, in which the "brave person" throws enough of themself at the enemy until they go down. Whilst not the most creative or innovative idea, it is still a valid strategy just not a very good or realistic one. This method involves all players charging at the enemy. This method is rather foolhardy, and much more difficult than standard play. To use this technique successfully, players will need to coordinate movements with each other to avoid wounding or killing each other with splash damage or friendly fire. This method consists of attempting to get through the level as quickly as possible, while also trying to get the most points possible. It often involves using vehicles and ignoring many enemies that the player may otherwise be inclined to shoot. The reason players do this is generally because they want the Legendary symbol for their service record; they may also wish to get the meta-game achievements by relying mainly on the time bonus for the level. This method makes up for the 2 or 3 weapon limit and has players focus on specific aspects of combat, such as enemy types or positioning. One of the most ideal strategies utilizes one of the players using weapons less resistant to shielding while another player uses weapons less resilient to non-shielded enemies. This way, shielded enemies would lose their shielding rather quickly and become vulnerable to the other player who would have the proper weapon equipped to finish off the enemy, effectively removing the need to constantly switch weapons. Ideally, the player assigned to shielded enemies would utilize Plasma Pistols for their overcharged shot while the player assigned to take out the non-shielded enemy would utilize headshot weapons, namely a Battle Rifle or Covenant Carbine, forming a two person Noob Combo. Plan is simple: one player attack the enemy from the front, whilst the other player goes round and either flanks the enemy from behind or attack them from the side. Can be used against the more powerful enemies in which two or more players would gang up to take a powerful enemy down or, can be used to eliminate large groups of Covenant using combined Assault or Battle Rifle fire. Alternatively, two players may not be needed for this method. It can be done using the UNSC Marines as a distraction for the Covenant whilst the lone player attacks from the side (or flanks). One example of this strategy actually being used is in the level "Tayari Plaza" in Halo 3 ODST, Australian marine Chips Dubbo suggests to Buck "flank the Covenant on the streets" whilst Dubbo and his team-mate distract the Brutes.